I have this urge to roast a whole (small) pig in my backyard, but I’ve not done it before. 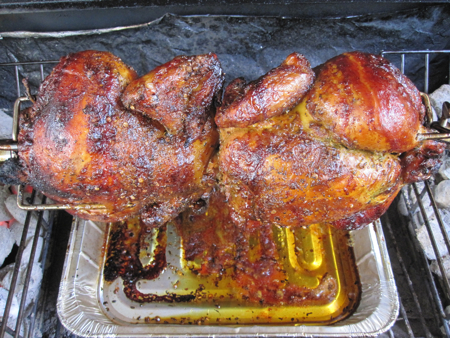 I discovered that a motorized rotisserie attachment was available for my grill for a mere $35, which I treated as a sign that my grand scheme should proceed. Still, I am unwilling to ruin $200 worth of baby pig, so I initiated a program of test runs to make sure I had a good feel for the interactions of machinery, fire, and meat. Experiment No. 1 was chicken: easy to roast, hard to screw up, not too much weight on the new rig, and needing only an hour and a half to cook. Andrea, my culinary consultant, had given me a spice rub she brought back from Egypt. It was a mixture of coriander seeds, tumeric, sumac, cumin, pepper, and a few other unidentifiable spices that stained my hands bright yellow. 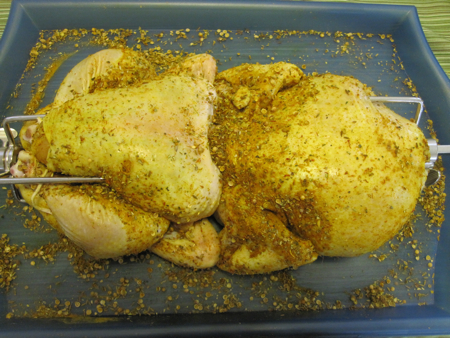 I rubbed it over and in two four-pound chickens that I had brined in a sugar and salt solution for an hour, making sure to get some of the rub under the skin. I trussed each chicken with twine (using the traditional method) to give them a uniform shape before sliding them onto the spit. I faced the breasts toward each other to protect them from the heat and rotated one of the chickens with its back facing up to distribute the weight. After securing them on the spit forks, I mounted the assembly on the grill. 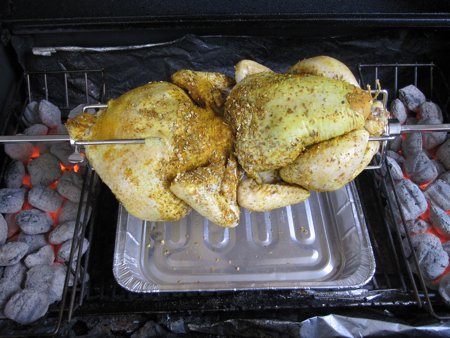 I divided the coals in baskets at either end and placed a drip pan under the chickens to avoid any mess and flare-ups. After an hour and a half of completely unattended spinning and cooking (I checked once at the half-hour mark to make sure everything was still properly positioned), the chickens were ready. The self-basting from the rostisserie resulted in chicken was moist, flavorful, and perfectly cooked with crisp skin. The spice rub was more subtle than I had expected, well-balanced and very aromatic. Experiment No. 1 was a success. The rig worked as advertised, I expended almost no effort tending the food, and it turned out tasty eats as well. However, I’ve spent too much of my life in the company of engineers, so I know another stress test is in order. I’m thinking of the tandoori turkey recipe from Paul Riddell at the Texas Triffid Ranch. Stay tuned. Thanks. I’ve got a turkey project ready to go this weekend. Eventually I’ll be confident enough to try a whole suckling pig on the rotisserie.